Pike's Peak Gold Rush in Colorado. Mining History. Prospectors headed for California’s gold country in 1849 panned small amounts of gold along in the area around the South Platte River in Colorado. Despite the discovery, compared to visions of unlimited wealth coming out of the Mother Lode in California, little interest was given to these newly discovered placers, and the gold seekers continued westward. Nearly a decade passed until gold seekers exploring the region panned Cherry Creek near what is the present day city of Denver. Rich gold deposits were discovered and word quickly spread, attracting men from all around the country to the area. Although it was nearly 75 miles away, the visions of Pike’s Peak on the horizon coined the name of the Pike’s Peak Gold Rush, as prospectors would know they were close when the caught a glimpse of the massive peak. As with most of the gold rushes across the west, thousands of men uprooted themselves and headed for the rich gold fields. 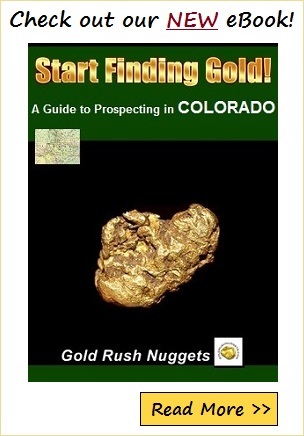 An estimated 100,000 people originally left in search of Colorado gold. Travelers would paint “Pike’s Peak or Bust” on the side of their wagons as the ventured across the country. Miners quickly claimed up ground surrounding Cherry Creek, and ventured outward in search of more nearby gold. For the first several years of the rush, most mining was concentrated near the South Platte River. Within a short time, Denver City, Boulder City, and Golden City sprang up and became substantial mining communities, supply miners with all the picks, shovels, and whiskey they could drink. As prospectors radiated out in search of more gold, they quickly discovered new deposits to the southwest at the Breckenridge and Fairplay Districts. Further exploration revealed that rich lode deposits were present throughout the region, and these ores were mined extensively. Later years would result in additional gold discoveries at Cripple Creek near the base of Pike’s Peak, as well as additional discoveries at the Telluride and Summitville Districts in the southwestern part of Colorado. The Pike’s Peak Gold Rush was short lived, like most gold rushes before it. The “’59ers”, as they came to be known, quickly exploited the rich placers and easily accessible lode deposits before continuing on to more fruitful ventures. Although the vast majority of the prospectors were gone within a few short years, some men remained in the area to continue mining. Colorado’s extensive lode mining resources were worked extensively in the coming decades, with several large commercial mines operating today in the same areas that the original ‘59ers prospected. Several fine ghost towns still remain in Colorado, providing a window to the past to one of America’s richest gold rushes.